"The Force, it's calling to you. Just let it in." What do a desert scavenger and a fugitive Stormtrooper have in common with an iconic war hero and the galaxy's greatest pilot? They are all coming to X-Wing™ in the Heroes of the Resistance Expansion Pack! With Heroes of the Resistance, Rey, Finn, Han Solo, and Poe Dameron all make the transition from the big screen to your tabletop. Rey and Han arrive as Resistance pilots for a new version of the Millennium Falcon with a sculpt and paint scheme that have been updated to reflect the ship's appearance in The Force Awakens. Finn supports the Resistance as a crew upgrade. And the galaxy's greatest pilot Poe Dameron can now fly to battle as Black One, sitting in the cockpit of his signature black T-70 X-wing. 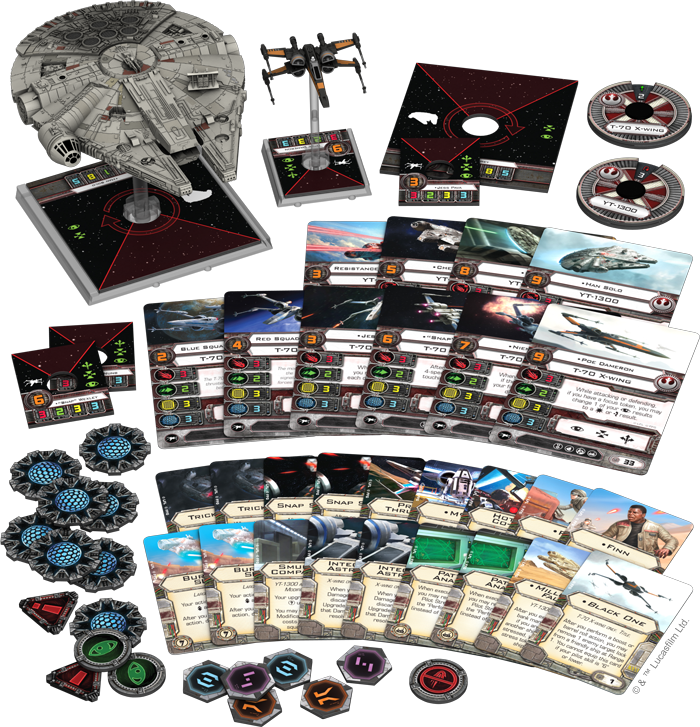 In addition to its new starship miniatures, Heroes of the Resistance introduces ten ship cards and eighteen upgrades, plus all requisite maneuver dials and tokens. These include a Poe Dameron with a pilot skill value of "9," ship cards for both Han Solo and Chewbacca that feature new pilot abilities, three new unique Resistance X-wing pilots, new elite pilot talents, new Tech upgrades, and unique Title upgrades for both the Millennium Falcon and Black One. While, in essence, it is still the same heavily customized YT-1300 light freighter that the galaxy has come to know and love, the Millennium Falcon from the Heroes of the Resistance Expansion Pack comes with a few key differences from the version in the Millennium Falcon Expansion Pack. First of all, you might notice the ship's new, rectangular sensor array. While this is likely the first change you may notice in the difference between the sculpts, it is not the only one. Heroes of the Resistance introduces a new sculpt and paint scheme for the Falcon that faithfully represent all the changes that the ship underwent between Return of the Jedi and The Force Awakens. 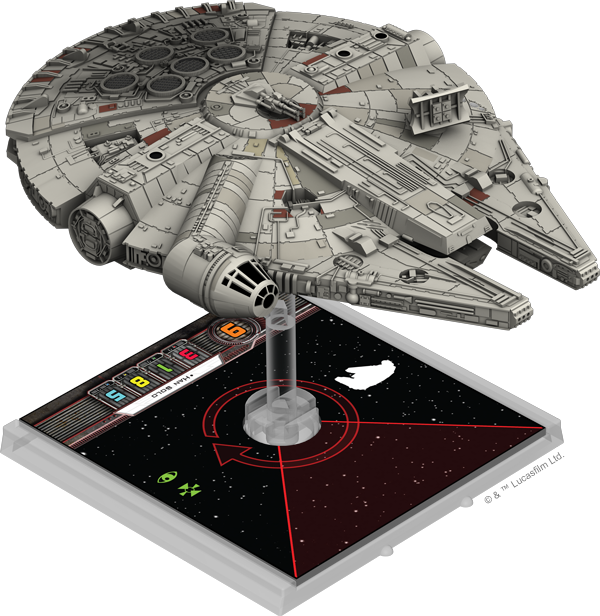 A closer look at the Millennium Falcon miniature from the Heroes of the Resistance Expansion Pack. 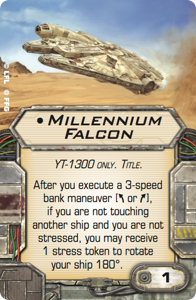 Next, you might notice that the expansion's new Millennium Falcon Title upgrade features a different ability from the version in the Millennium Falcon Expansion Pack. While that version seemed to reflect Han Solo's ability to fly the Falcon out of the most improbable of situations, the new version calls to mind Rey's piloting in The Force Awakens, as she looped back on her opponents after flying out of the hull of a crashed Star Destroyer. And just as that maneuver allowed Finn to line up a shot, the new Title upgrade allows your Falcon to catch your opponents squarely in your firing arc more often than not. And that is a good thing. For even as Heroes of the Resistance introduces new versions of both Han Solo and Chewbacca, it also marks the debut of Rey . 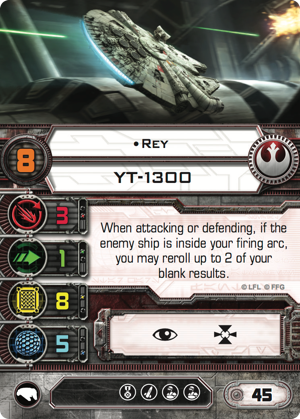 The Falcon may come with a turret primary weapon, but Rey's ability ensures that you get the most mileage from your Falcon when you can maneuver it skillfully. Whenever she attacks or defends against an enemy ship within her firing arc, she can reroll up to two blank dice. Accordingly, even as Heroes of the Resistance promotes the exploration of new tactics, it emphasizes the importance that the game places upon skillful maneuvering, reinforcing one of the game's core joys. At the time of The Force Awakens, Poe Dameron enjoys a reputation for being the Star Wars galaxy's greatest pilot, and Heroes of the Resistance offers both a new T-70 X-wing miniature and ship card worthy of his reputation. 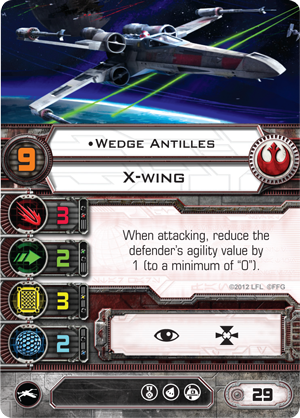 Among other things, X-Wing has earned a reputation for the high quality of its pre-painted miniatures. 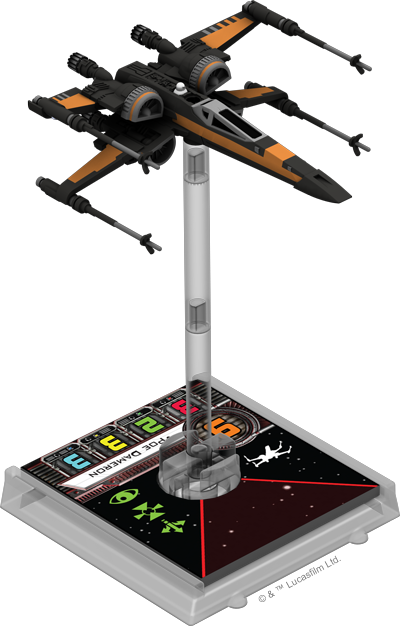 These miniatures transform your games into richly immersive Star Wars experiences, and the new T-70 X-wing miniature in Heroes of the Resistance adds to your experience by allowing you to fly Poe in his custom black-and-orange fighter. More than that, though, this new T-70 X-wing has been updated with a new detail certain to catch the attention of every true Star Wars fan: instead of the R4 astromech that comes with the standard T-70 X-wing sculpt, Poe Dameron's signature vessel comes sculpted with his faithful astromech companion, BB-8. 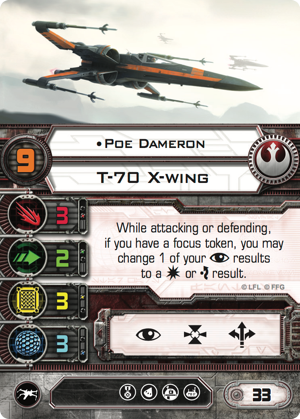 A closer look at Poe Dameron's black-and-orange T-70 X-wing. "While attacking or defending, if you have a focus token, you may change 1 of your results to a or result." Yet where his unique pilot talent remains unchanged, Poe's pilot skill value has been increased from "8" to "9," a change accompanied by a corresponding increase in his cost from thirty-one squad points to thirty-three. This change from "8" to "9" is particularly meaningful because it vaults Poe into the very top echelon of X-Wing pilots. No pilot in the game has a base pilot skill value greater than "9." This is the elite value shared by the likes of Darth Vader and Wedge Antilles , and now Poe joins those ranks. 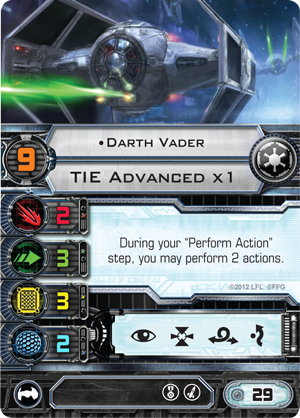 This means that Poe stands an even better chance than before of maneuvering after his opponents and firing before them. 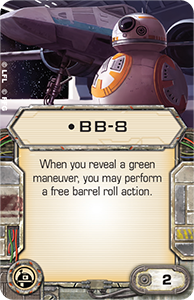 Given the versatility that he gains from his ship's boost action, especially when BB-8 is aboard, the ability to maneuver after his opponents makes it easy for Poe to line up his shots, round after round. And firing first is just as crucial… because after Poe has destroyed a ship, he is freed from the threat of return fire. As the seventh installment in the Star Wars saga, The Force Awakens proved to be an instant classic, honoring everything that made the original trilogy a worldwide phenomenon. 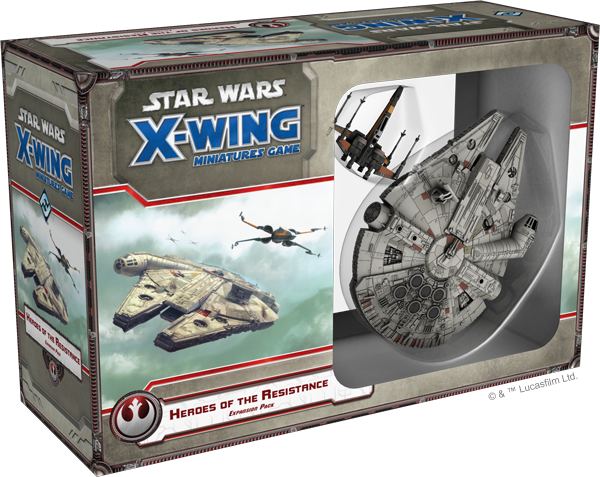 Now, Heroes of the Resistance looks to make a similar impact upon the X-Wing miniatures game. No matter whether you are a new player, just joining the game with The Force Awakens™ Core Set, or you're the grizzled veteran of a hundred dogfights, Heroes of the Resistance expands your game with myriad new options, even as it honors and reinforces all of the most important elements of its design. Join the fight against the First Order. Heroes of the Resistance is scheduled to arrive at retailers in the third quarter of 2016!